Staying in a self-catering vacation apartment is one of the best ways to experience life in Italy. But if it’s on a farm or in the countryside you may be somewhat isolated. 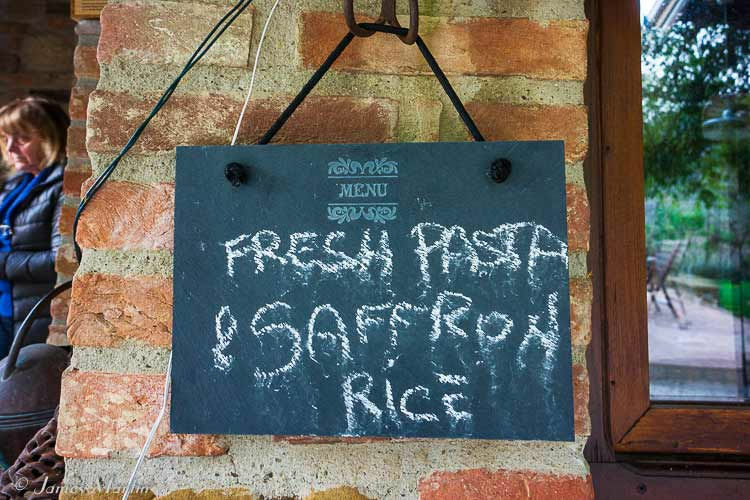 That’s not the case at Il Fontanaro Agriturismo where you’ll have not only a nice apartment but also knowledgeable bilingual people to help you plan your day, food from their organic farm, and the charming little town of Paciano, just a 15 minute walk away. By car it’s easy to explore Umbria and parts of Tuscany. Our one-bedroom apartment was comfortable and well-equipped. In the living room we had information about places to see, books, a stereo, and TV. From our terrace in front of the house we had a beautiful view of the countryside, a great place to watch the sunset. I’ve stayed in a variety of self-catering apartments, but I was very impressed upon arrival to see the kitchen well stocked with essentials as well as extras such as freshly baked bread, milk and yogurt, fruit, and olive oil and honey produced on the farm. There was even a bottle of wine. Guests can pick vegetables from the family garden, too. In the morning, Alina invites guests for a cup of coffee and helps them plan their day based on their interests. When I said I wanted to go to a town with hot springs, she suggested a great place and even explained how to get to the more private area used only by locals. She also arranged a winery tour and wine tasting for us at a small, family-run winery. In the evenings, you can prepare your own dinner, go into Paciano for pizza or a restaurant meal, or you can have the restaurant deliver dinner to you. Alina has made a special arrangement with one of the local restaurants to not only give you a discount but also deliver your meal, a fantastic idea. 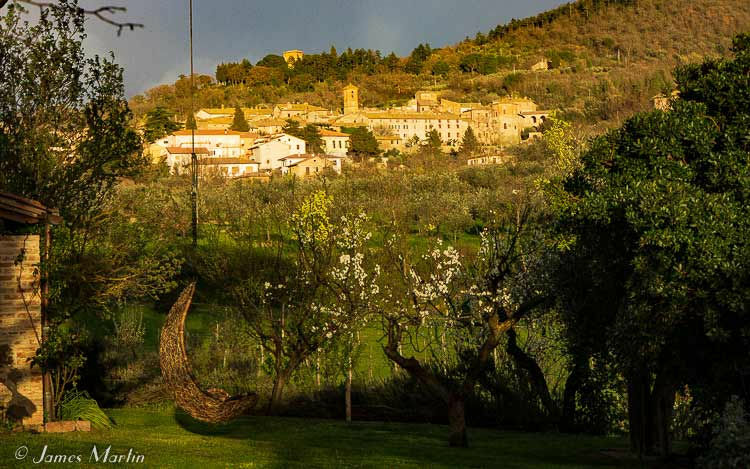 Il Fontanaro Agriturismo has several guest houses and villas, all beautifully restored. 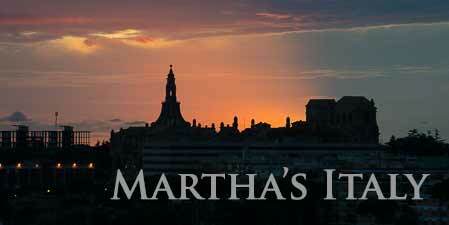 Each apartment has a fireplace, well-stocked kitchen, and either a terrace or balcony. Two 1-bedroom cottages are at Fontanaro itself, where Lucia and Alina (and their dogs) live. Communal areas include a swimming pool, reading room, and large wine and travel library. Guests are free to wander around the farm, mingle or spend time relaxing alone. It’s a perfect place to experience “country slow living”. 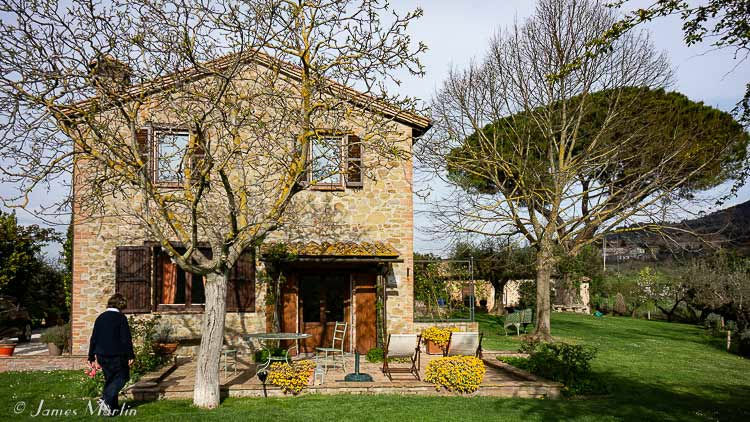 Above Fontanaro, and even closer to Paciano, is Tartagli, a villa divided into three independent apartments (1-bedroom, 2-bedroom, and 3-bedroom) that together can sleep a total of 12 people. Fontegirasole is a 20 person villa divided into 5 1-bedroom apartments, on the other side of Paciano. Each property has its own swimming pool. 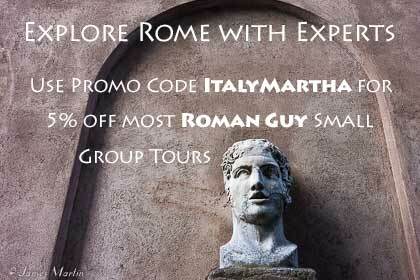 For details, photos, and booking, see Il Fontanaro Country Slow Living. 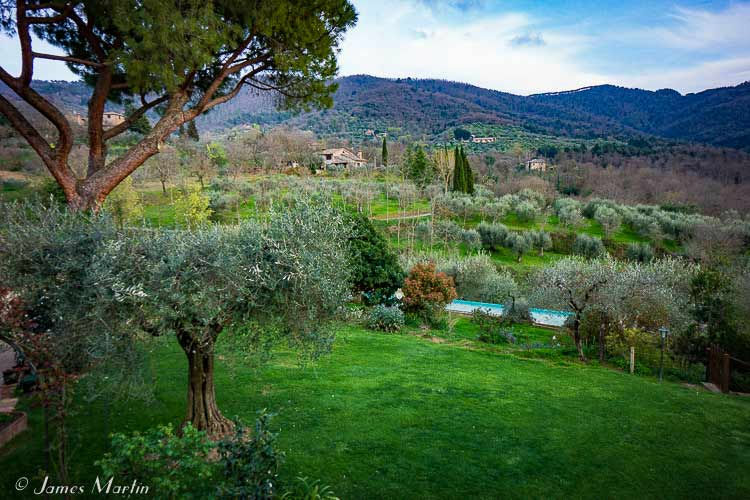 Il Fontanaro farm is the dream of Lucia Pinelli. She and her husband bought the farm when there was just a farm house and a few olive trees, the year that their daughter Alina was born. They remodeled the farm house and out buildings to make guest houses, the library and wine cellar, and the olive oil mill. They now have over 2500 olive trees and they bought their own mill so they can crush the olives and bottle their olive oil right on the farm, ensuring that it’s organic. Lucia is passionate about olive oil and she and her children work hard to educate people about the quality of olive oils. She travels to other countries, including the US, to present her oil. Il Fontanaro Olive Oil has won prestigious awards from Slow Food, Gambero Rosso, and in the US. Lucia showed us the organic heirloom corn they grow to make their own polenta, grinding it on the farm just before using it. We were lucky enough to get to try it and it was fantastic, much better than what we normally buy in stores. They raise bees and make their own honey, too. In addition to being a great hostess for the guests, Alina is a sommelier and there’s a big library of wines that guests can purchase. She’s also a chef and teaches cooking classes for guests at the farm. Paciano is a pretty walled town, just small enough that you can feel like a local. Paciano has a bar, grocery store, and restaurants (offering discounts to Fontanaro guests). Ask Lucia or Alina to arrange a visit to the local museum where there’s a beautiful mural. There’s a lot to do near the farm. Alina can arrange horseback riding, winery visits, a cheese tour, massage and spa treatments, or cooking classes. She’ll also make restaurant recommendations and reservations. Il Fontanaro is in a beautiful part of the Umbrian countryside that’s a great place for a drive. Lake Trasimeno, the hill towns of Orvieto and Gubbio, and the city of Perugia are good day trips. Il Fontanaro is also very near the border of Tuscany so you can easily visit the hill town of Montepulciano, the Val d’Orcia, a couple of Tuscany spa towns, Cortona, and Siena. Disclaimer: As is common in the travel industry we were provided with complimentary lodging, however that did not influence this article.